Harry Robbins Haldeman, the son of a successful businessman, was born in Los Angeles on 27th October, 1926. His father, Harry Francis Haldeman, ran a successful heating and air conditioning supply company and was active in the Republican Party. Haldeman and his brother and sister were brought up as Christian Scientists. Haldeman attended the University of Redlands and the University of Southern California, before serving in the Naval Reserve during the Second World War. He graduated from the University of California in 1948. The following year he married Joanne Horton in 1949. In 1949 Haldeman joined the J. Walter Thompson advertising agency in New York. Later he was promoted to the post of vice president and manager of the California office. Haldeman's father was a financial backer of Richard Nixon. Haldeman got to know Nixon when he was serving as vice president under Dwight D. Eisenhower in 1952. Haldeman helped Nixon in his unsuccessful 1960 campaign against John F. Kennedy. He also managed Nixon's unsuccessful campaign for the governorship of California in 1962. In the 1968 Presidential Election, he was chief of staff of Nixon's presidential campaign. It has been claimed that Haldeman used his experience in the advertising industry to provide a new, more positive image of Nixon to the public. After Nixon's election he was appointed the president's chief of staff. In April, 1969, Richard Nixon appointed Jack Caulfield as Staff Assistant to the President. Soon afterwards Nixon decided that the White House should establish an in-house investigative capability that could be used to obtain sensitive political information. After consulting Haldeman and John Ehrlichman the job was given to Caulfield. Caulfield now appointed an old friend, Tony Ulasewicz, to carry out this investigative work. Ulasewicz's first task was to investigate the links between Bobby Baker and leading Democratic Party politicians. He was also ordered by Caulfield to set up a round-the-clock surveillance of Edward Kennedy. Over the next three years Ulasewicz traveled to 23 states gathering information about Nixon's political opponents. This included people such as Edmund Muskie, Larry O'Brien, Howard Hughes and Jack Anderson. On 17th June, 1972, Frank Sturgis, Virgilio Gonzalez, Eugenio Martinez, Bernard L. Barker and James W. McCord were arrested while removing electronic devices from the Democratic Party campaign offices in an apartment block called Watergate. It appeared that the men had been to wiretap the conversations of Larry O'Brien, chairman of the Democratic National Committee. The phone number of E.Howard Hunt was found in address books of the burglars. Reporters were now able to link the break-in to the White House. Bob Woodward, a reporter working for the Washington Post was told by a friend who was employed by the government, that senior aides of President Richard Nixon, had paid the burglars to obtain information about its political opponents. In 1972 Nixon was once again selected as the Republican presidential candidate. On 7th November, Nixon easily won the the election with 61 per cent of the popular vote. Soon after the election reports by Bob Woodward and Carl Bernstein of the Washington Post, began to claim that some of Nixon's top officials were involved in organizing the Watergate break-in. Haldeman was involved in the cover-up from the beginning. In April 1973, Nixon forced Haldeman and John Ehrlichman, to resign. A third adviser, John Dean, refused to go and was sacked. On 20th April, Dean issued a statement making it clear that he was unwilling to be a "scapegoat in the Watergate case". When Dean testified on 25th June, 1973 before the Senate Committee investigating Watergate, he claimed that Richard Nixon participated in the cover-up. He also confirmed that Nixon had tape-recordings of meetings where these issues were discussed. The Special Prosecutor now demanded access to these tape-recordings. At first Nixon refused but when the Supreme Court ruled against him and members of the Senate began calling for him to be impeached, he changed his mind. However, some tapes were missing while others contained important gaps. Under extreme pressure, Nixon supplied tapescripts of the missing tapes. It was now clear that Nixon had been involved in the cover-up and members of the Senate began to call for his impeachment. On 9th August, 1974, Richard Nixon became the first President of the United States to resign from office. Nixon was granted a pardon but Haldeman was convicted of conspiracy and obstruction of justice and served 18 months in prison for his role in the Watergate cover-up. On his release from prison Haldeman became vice president of the David H. Murdoch real estate development company. 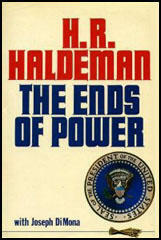 In 1978, Haldeman published his autobiography The Ends of Power. 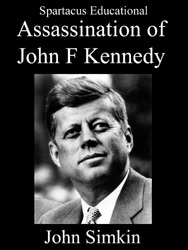 In the book he disclosed information on the assassination of John F. Kennedy: "After Kennedy was killed, the CIA launched a fantastic cover-up. The CIA literally erased any connection between Kennedy's assassination and the CIA... in fact, Counter intelligence Chief James Angleton of the CIA called Bill Sullivan of the FBI and rehearsed the questions and answers they would give to the Warren Commission investigators." Harry Robbins Haldeman died of cancer on 12th November, 1993; at his home in Santa Barbara, California. Chuck Colson had become the President's personal 'hit man'; his impresario of 'hard ball' politics. I had been caught in the middle of most of these, as complaints thundered in about 'Wildman' Colson either crashing arrogantly; or sneaking silently, through political empires supposedly controlled by White House staffers such as Domestic Counselor John Ehrlichman or Cabinet Officers such as Attorney General John Mitchell. Colson cared not who complained. Nixon, he said, was his only boss. And Nixon was behind him all the way on projects ranging from his long-dreamed-of hope of catching Senator Teddy Kennedy in bed with a woman not his wife, to more serious struggles such as the I.T.T. anti-trust 'scandal'. Colson had signed up an ex-C.I.A, agent named Howard Hunt to work for him and thereafter became very secretive about his exploits in the name of Nixon. Years later I heard of such wild schemes as the proposed fire bombing of a politically liberal foundation (Brookings) in order to retrieve a document Nixon wanted; feeding LSD to an anti-Nixon commentator (Jack Anderson) before he went on television; and breaking into the offices of a newspaperman (Hank Greenspun) who was supposed to have documents from Howard Hughes that revealed certain secrets about Nixon. But Colson's 'black' projects were so widely rumoured around the White House that I believe almost every White House staffer thought of his name the minute they heard the news of Watergate. For years Nixon had been trying to track down proof that Larry O'Brien was on Howard Hughes's payroll as a lobbyist at the same time that he was Chairman, of the Democratic National Committee. This could be hot ammunition to discredit O'Brien, Nixon believed. What had O'Brien done in exchange for Hughes's money (reportedly, a huge $180,000-a-year retainer)? A wiretap on O'Brien's telephone and a bug in his office could obtain the proof Nixon wanted. To take such a risk as that burglary to gain that information was absurd, I thought. But on matters pertaining to Hughes, Nixon sometimes seemed to lose touch with reality. His indirect association with this mystery man may have caused him, in his view, to lose two elections. His brother Don had been granted a $205,000 loan from Hughes in the 1950s when Nixon was Vice-President. Jack Anderson had broken that story shortly before the 1960 election, and Nixon felt his razor-thin defeat by John Kennedy was partially due to that story. Then; in the 1962 California gubernatorial rare the loan had surfaced again, this time in a Reporter magazine article by James Phelan - and Governor Pat Brown could have credited his surprise victory over Nixon to the repercussions of that story. And yet, even with this background,, at that very moment, unknown to me at the time, $100,000 of Hughes's cash was resting in a safe deposit box in Florida leased by Charles 'Bebe' Rebozo, Nixon's closest personal friend. Years later, in 1976, I asked Nixon about that $100,000, which by then had been the subject of vigorous investigation for years. The investigation had finally petered out with no results. Rebozo explained that the $100,000 was a campaign contribution, and the reason it never reached the Campaign Committee was that an internecine war had broken out in the Hughes empire; Rebozo said he was afraid the President would be embarrassed by one side or another in the Hughes war if the campaign contribution was revealed. I was puzzled when he (Nixon) told me, "Tell Ehrlichman this whole group of Cubans is tied to the Bay, of Pigs." After a pause I said, "The Bay of Pigs? What does that have to do with this?" But Nixon merely said, "Ehrlichman will know what I mean," and dropped the subject. After our staff meeting the next morning I accompanied Ehrlichman to his office and gave him the President's message. Ehrlichman's eyebrows arched, and he smiled. "Our brothers from Langley? He's suggesting I twist or break a few arms?" Ehrlichman leaned back in his chair, tapping a pencil on the edge of his desk. "All right," he said, "message accepted." "Zero," said Ehrlichman. "I want to stay out of this one." He was referring to an unspoken feud between C.I.A. Director Richard Helms and Nixon.. The two were polar opposites in background: Helms, the aloof, aristocratic, Eastern elitist; Nixon the poor boy (he never let you forget it) from a small California town. Ehrlichman had found, himself in the middle of this feud as far back as 1969, immediately after Nixon assumed office. Nixon had called Ehrlichman into his office and said he wanted all the facts and documents the CIA had on the Bay of Pigs, a complete report on the whole project. About six months after that 1969 conversation, Ehrlichman had stopped in my office. "Those bastards in Langley are holding back something. They just dig in their heels and say the President can't have it. Period. Imagine that! The Commander-in-Chief wants to see a document relating to a military operation, and the spooks say he can't have it." "I don't know, but from the way they're protecting it, it must be pure dynamite." I was angry at the idea that Helms would tell the President he couldn't see something. I said, "Well, you remind Helms who's President. He's not. In fact, Helms can damn well find himself out of a job in a hurry." That's what I thought! Helms was never fired, at least for four years. But then Ehrlichman had said, "Rest assured. The point will be made. In fact, Helms is on his way over here right now. The President is going to give him a direct order to turn over that document to me." Helms did show up that afternoon and saw the President for a long secret conversation. When Helms left, Ehrlichman returned to the Oval Office. The next thing I knew Ehrlichman appeared in my office, dropped into a chair, and just stared at me. He was more furious than I had ever seen him; absolutely speechless, a rare phenomenon for our White House phrase-makers. I said, "What happened?" "This is what happened," Ehrlichman said. "The Mad Monk (Nixon) has just told me I am now to forget all about that CIA document. In fact, I am to cease and desist from trying to obtain it." When Senator Howard Baker of the Evrin Committee later looked into the Nixon-Helms relationship, he summed it up. "Nixon and Helms have so much on each other, neither of them can breathe." Apparently Nixon knew more about the genesis of the Cuban invasion that led to the Bay of Pigs than almost anyone. Recently, the man who was President of Costa Rica at the time - dealing with Nixon while the invasion was being prepared - stated that Nixon was the man who originated the Cuban invasion. If this was true, Nixon never told it to me. In 1972 I did know that Nixon disliked the CIA Allen Dulles, the CIA Director in 1960, had briefed Jack Kennedy about the forthcoming Cuban invasion before a Kennedy-Nixon debate. Kennedy used this top secret information in the debate, thereby placing Nixon on the spot. Nixon felt he had to lie and even deny such an invasion was in the works to protect the men who were training in secret. Dulles later denied briefing Kennedy. This betrayal, added to Nixon's long-held feeling that the agency was not adequately competent, led to his distrust and dislike. And now that antipathy was to emerge again on June 23, 1972, when Nixon would once again confront and pressure the CIA. This time the CIA was ready. In fact, it was more than ready. It was ahead of the game by months. Nixon would walk into what I now believe was a trap. President Nixon, after accepting the resignations of four of his closest aides, told the American people last night that he accepted full responsibility for the actions of his subordinates in the Watergate scandal. "There can be no whitewash at the White House," Mr. Nixon declared in a special television address to the nation. He pledged to take steps to purge the American political system of the kind of abuses that emerged in the Watergate affair. The President took his case to the country some 10 hours after announcing that he had accepted the resignations of his chief White House advisers, H.R. Haldeman and John D. Ehrlichman, along with Attorney General Richard G. Kleindienst. He also announced that he had fired his counsel, John W. Dean III, who was by the ironies of the political process a casualty of the very scandal the President had charged him to investigate. The dramatic news of the dismantling of the White House command staff that served Mr. Nixon through his first four years in the presidency was the most devastating impact that the Watergate scandal has yet made on the administration. The President immediately set into motion a major reshuffling of top administration personnel to fill the slots of the Watergate causalities. Defense Secretary Elliott L. Richardson was appointed to replace Kleindienst and to take over responsibility for "uncovering the whole truth" about the Watergate scandal. He said last night that he was giving Richardson "absolute authority" in handling the Watergate investigation - including the authority to appoint a special prosecutor to supervise the government's case. As temporary successor to Dean, the President chose his special consultant, Leonard Garment. Mr. Nixon said Garment "will represent the White House in all matters relating to the Watergate investigation and will report directly to me." Last night Gordon Strachan, whose name has been linked to the Watergate case, resigned as general counsel to the United States Information Agency. The USIA said the former aide to Haldeman resigned "after learning that persons with whom he had worked closely at the White House had submitted their resignations. . ."
Besides the resignations announced yesterday, at least five other high administration or campaign officials have quit in the wake of revelations about the Watergate: Mitchell, presidential appointments secretary Dwight Chapin, special counsel to the president Charles W. Colson, deputy campaign director Jeb Stuart Magruder and acting FBI Director L. Patrick Gray III. The massive shake-up of the White House command and the ensuing personnel reshuffling threw the administration into a state of disarray if not temporary immobility. It threatens the federal government's largest single enterprise, the pentagon, with a state of leaderlessness with Richardson's new assignment. In the White House, Haldeman and Ehrlichman had been the twin pillars of a management system in which they had been regarded as indispensable to the President. Haldeman, particularly, was the ultimate traffic controller and organizer of the flow of presidential business. It's possible that Nixon learned from Sullivan something about the earlier CIA cover-up by Helms. And when Nixon said, "It's likely to blow the whole Bay of Pigs" he might have been reminding Helms, not so gently, of the cover-up of the CIA assassination attempts on the hero of the Bay of Pigs, Fidel Castro - a CIA operation that may have triggered the Kennedy tragedy and which Helms desperately wanted to hide. The Haldeman Theory of the break-in is as follows: I believe Nixon told Colson to get the goods on O'Brien's connection with Hughes at a time when both of them were infuriated with O'Brien's success in using the I.T.T. case against them. I believe Colson then passed the word to Hunt who conferred with Liddy who decided the taps on O'Brien and Oliver, the other Hughes' phone, would be their starting point. I believe the Democratic high command knew the break-in was going to take place, and let it happen. They may even have planted the plainclothesman who arrested the burglars. I believe that the C.I.A. monitored the Watergate burglars throughout. And that the overwhelming evidence leads to the conclusion that the break-in was deliberately sabotaged. (In this regard, it's interesting to point out that every one of the Hunt-Liddy projects somehow failed, from the interrogation of DeMotte, who was supposed to know all about Ted Kennedy's secret love life and didn't, to Dita Beard, to Ellsberg, to Watergate). The 10:00 A.M., June 20, meeting was held in Ehrlichman's office the one in which he'd produced Admiral Welander's confession six months earlier-and was attended by Haldeman, Mitchell, Kleindienst, and Dean. The first subject, as always, was leaks. How had the information about McCord and Hunt gotten out? Kleindienst assured the men that it had not come from justice, but from the Metropolitan Police Department. Dean maintained a deep silence, and the other men were completely in the dark about the events, so there wasn't much to discuss. Haldeman and Ehrlichman harbored doubts about Mitchell's role in the break-in, but, according to Haldeman's memoir, though the meeting produced no new information he was glad to see that Mitchell "looked better than I had seen him in days. He puffed on his pipe with that humorous glint in his eye that we all knew so well. I felt that was a good sign because Mitchell was now the Chairman of CRP, and should have been worried if there was a major crisis impending. Instead, he said, `I don't know anything about that foolishness at the DNC. I do know I didn't approve the stupid thing.' We believed him-and that lightened our mood considerably." Dean left that meeting in the company of Kleindienst, and returned to justice with the attorney general. Kleindienst was furious about the break-in and about Liddy's approach to him at Burning Tree. Dean said nothing about his role in those events. When they reached the Justice building and the two men were joined by Henry Petersen, the assistant attorney general in charge of the criminal division, Dean's motive for making the trip became clear: He wanted the FBI 302s, the investigative reports prepared by the field agents. Dean invoked Nixon's name to get them. "The representation that he (Dean) made to me and to Mr. Petersen throughout was that he was doing this for the President of the United States and that he was reporting directly to the President," Kleindienst later testified. Kleindienst and Petersen quite properly refused to give up the 302s, which were raw data, and said they would only supply summaries of the data. The attorney general added that if the president wanted to see the reports, he would take them to Nixon himself. Dean left, empty-handed. Meanwhile, back at the White House, Haldeman was reporting to Nixon what had happened in the ten o'clock meeting - but the exact particulars of that conversation will never be known, because that's the tape in which there is the infamous eighteen-and-a-half-minute gap. A new notion on how that gap came into being will be offered in a later chapter, but at this point in the narrative we can suggest some of what was covered in the meeting, based on the memoirs of both participants. According to both men, Nixon's main interest was in the Hunt-Colson connection. He had learned from Colson that Hunt had been involved in the Bay of Pigs operation, and that gave him an idea. As he remembered in RN, Nixon told Haldeman that the way to play the break-in was to say it had been a Cuban operation, perhaps designed ' to learn how the Democrats were going to view Castro in the coming election; that would stir the anti-Castro community in Miami "to start - a public bail fund for their arrested countrymen and make a big media issue out of it." This would damage the Democrats and at the same time turn the Watergate affair into something favorable to the White House. Haldeman's June 23 meeting with the president ended at 11:39 A.M., and he immediately arranged a meeting between Walters, Helms, himself, and Ehrlichman for 1:30 p.m. Moments before that meeting, Haldeman poked his head in again to the Oval Office, and Nixon reemphasized the way to get the CIA to cooperate. Tell the CIA officials, Nixon instructed, "it's going to make the ... CIA look bad, it's going to make Hunt look bad, and it's likely to blow the whole Bay of Pigs thing, which we think would be very unfortunate for the CIA and for the country at this time, and for American foreign policy... I don't want them to get any ideas we're doing it because our concern is political." Haldeman answered that he understood that instruction. Haldeman was once again impressed, he writes, by Nixon's brilliant instincts. "Dean had suggested a blatant political move by calling in the CIA-now Nixon showed how much more astute he was by throwing a national security blanket over the same suggestion." At 1:30, in Ehrlichman's office, the four men sat down. All the participants knew that Helms disliked Nixon and the feeling was mutual. But now Nixon had been maneuvered into believing he had a need to use Helms and his agency. The director began the conversatior by surprising Haldeman with the news that he had already spoken t( Gray at the FBI and had told him that there was no CIA involvement, in the break-in and none of the suspects had worked for the Agency ic the last two years. After Helms's surprise, Haldeman then played what he called "Nixon's trump card," telling the CIA men that the entire affair might be linked to the Bay of Pigs. "Turmoil in the room," Haldeman reported later in his book "Helms gripping the arms of his chair, leaning forward and shouting `The Bay of Pigs had nothing to do with this. I have no concern about the Bay of Pigs.' "
Haldeman understood that Nixon had been right about mentioning, the old disaster, for Helms immediately calmed down and voiced some further objections to having Walters tell Gray to back off. Ehrlichman' remembrance of the meeting closely parallels Haldeman's. Just a important is the fact that neither man mentioned in his memoir telling the CIA chiefs that the reason for asking them to block the FBI was political; following Nixon's rather precise instructions, that notion was specifically kept out of the conversation. At 2:20 P.M. Haldeman went back to the Oval Office and informed Nixon that "Helms kind of got the picture" and had promised, "`We'll be happy to be helpful, to ah-you know-and we'll handle everything you want.' " Haldeman then added: "Walters is gonna make the call to Gray." The CIA men agreed to help, Helms would later testify, only because they figured the president was privy to a CIA operation in Mexico that even the CIA director did not know about. "This possibility always had to exist," Helms said. "Nobody knows everything about everything." Dean apparently had an idea about what was going on, for at 1:35 that afternoon-before Haldeman actually had had a chance to brief the president on the Helms meeting - Pat Gray got a call from Dean apprising him that Walters would be phoning for an appointment, and that Gray should see him that afternoon. Waiters' secretary called Gray twenty minutes later and scheduled a 2:30 p.m. meeting. Dean phoned Gray again at 2:19 p.m. to see if it was on, learned that it was, and asked Gray to call him when he'd seen Walters. Once again, John Dean's testimony on these events is strikingly at odds with that of others. In his testimony to the Senate Watergate committee, before the committee was to hear from Gray about the Gray-Dean telephone conversations of June 23, Dean would first avoid revealing any knowledge of the Helms-Walters meeting. Then, when pressed by Senator Inouye, Dean claimed that he had "had no idea that Mr. Haldeman and Mr. Ehrlichman were going to meet with Mr. Helms and General Walters, that was unknown to me until I subsequently was so informed by Mr. Ehrlichman but not as to the substance of the meeting they had held." Gray and Walters met at 2:34 p.m. at FBI headquarters, and, according to Gray's testimony before Congress, Walters "informed me that we were likely to uncover some CIA assets or sources if we continued our investigation into the Mexican money chain.... He also discussed with me the agency agreement under which the FBI and CIA have agreed not to uncover and expose each other's sources." Acting Director Gray had never read that agreement, but considered it logical, and told Walters that the matter would be handled "in a manner that would not hamper the CIA."